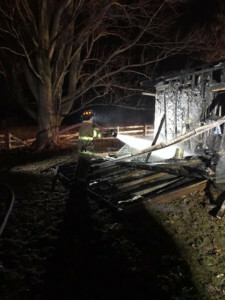 On Friday March 15th at approximately 1am, a passing Monroe County Sheriff Deputy discovered a structure fire in the 4200 block of Clover Street in Honeoye Falls. He radioed for assistance and was able to evacuate the family of seven from the residence. The Honeoye Falls Fire Department. was dispatched with assistance from Mendon and Rush Fire Departments. First arriving units discovered a fully involved shed with extension into a two-car garage. The fire was brought under control in less than twenty minutes with significant damage to both structures. There was no damage to the residence and the family was able to safely return. The Honeoye Falls Fire Dept was assisted by the Mendon, Rush, Henrietta and East Avon Fire Departments as well as the Honeoye Falls Mendon Ambulance, Monroe County Fire Bureau and the Monroe County Sheriffs Office.